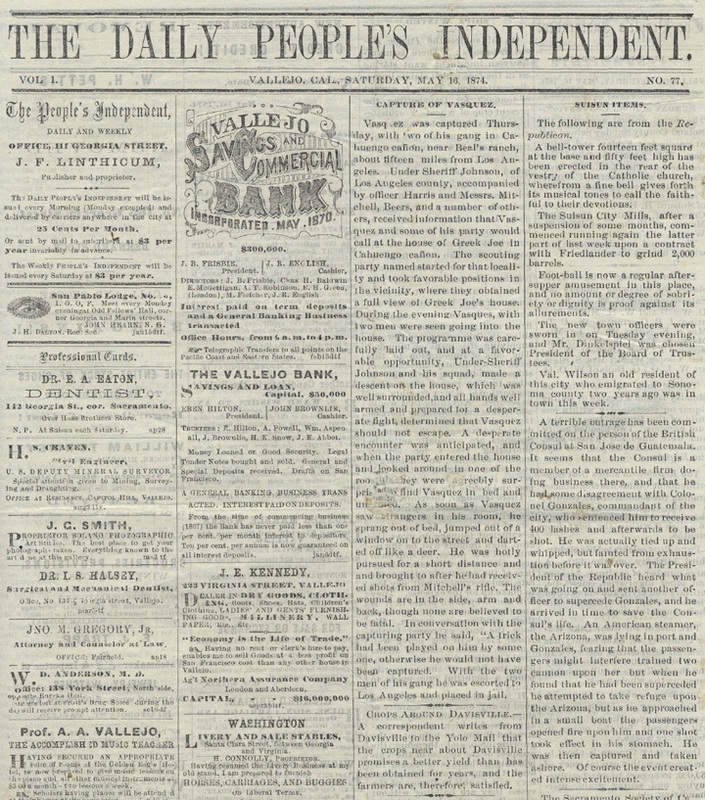 The Daily People's Independent (Vallejo, California): Capture of Vasquez, 5-16-1874. Vasquez was captured Thursday, with two of his gang in Cahuengo canon, near Beal's ranch, about fifteen miles from Los Angeles. Under-Sheriff Johnson, of Los Angeles county, accompanied by officer Harris and Messrs. Mitchell, Beers, and a number of others, received information that Vasquez and some of his party would call at the house of Greek Joe in Cahuengo canon. The scouting party named started for that locality and took favorable positions in the vicinity, where they obtained a full view of Greek Joe's house. During the evening Vasques, with two men were seen going into the house. The programme was carefully laid out, and at a favorable opportunity, Under-Sheriff Johnson and his squad, made a descent on the house, which was well surrounded, and all hands well armed and prepared for a desperate fight, determined that Vasquez should not escape. A desperate encounter was anticipated, and when the party entered the house and looked around in one of the rooms, they were agreebly surprised to find Vasquez in bed and undressed. As soon as Vasquez saw strangers in his room, he sprang out of bed, jumped out of a window on to the street and darted off like a deer. He was hotly pursued for a short distance and and brought to after he had received shots from Mitchell's rifle. The wounds are in the side, arm and back, though none are believed to be fatal. In conversation with the capturing party he said, "A trick had been played on him by some one, otherwise he would not have been captured. With the two men of his gang he was escorted to Los Angeles and placed in jail.